Exterior shot of Jazzhand's - Rugby, North Dakota's sketchiest piano bar. The cinderblock building has seen better days, and a "z" is burned out on the neon sign. A couple of Harleys are lined up outside the doors in the gravel parking lot. A beat-to-hell, green VW camper is parked on the opposite side of the lot. Inside. The front room of Jazzhand's is poorly lit, and has a bar running the length of the room with a few booths along the back wall. A hallway at the back of the room leads to the piano bar. The bartender--BUFORD LEE JAZZHAND--stands behind the bar cleaning a glass with a towel. 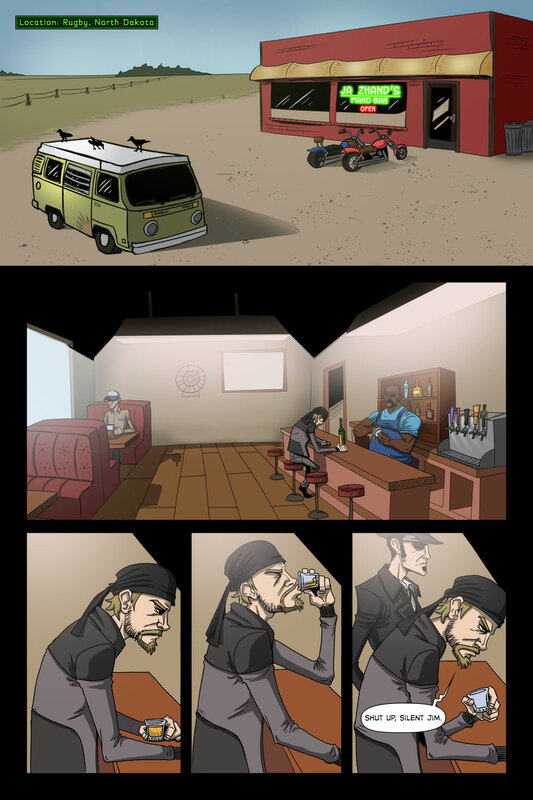 Off to the side, a TRUCKER sits alone in a booth, nursing a beer. GABRIEL sits hunched over at the bar. The guy looks bad. At least four days of beard growth. He doesn't have a sword. He's got a solid drunk going--contemplative bordering on sloppy--and he's brooding like crazy. One hand is wrapped around a glass of liquor sitting on the bar. Buford has left the bottle. Closeup on Gabriel, staring blankly into the middle distance. Same shot. Gabriel raises the drink to his lips and drains the glass. Same shot. Gabriel puts the empty glass down. SILENT JIM has appeared behind him out of nowhere. Gabriel doesn't seem pleased. I can only see two pages? Two’s all we’ve got up so far. 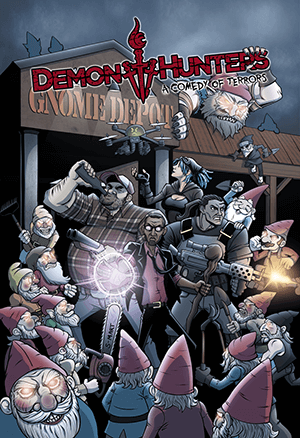 Demon Hunters is a weekly webcomic. A new page will be posted every Tuesday morning, so come back next week for more! Oh and by the way, You’ve done great job so far, keep it up! I am a huge Dead Gentlemen fan (and booth troll at Gen Con) and Demon Hunters has always been my favorite DG creation. Thank you so much for bring the World of Dimness back to life! Especially thanks to Jimmy for being a big a fan of DH as I am. I look forward to seeing Gabriel and the others ride again. Is there going to be a link that will take us to the latest page or will we be needing to hit the latest button just below the page every visit? Starting next week, the latest page will always show up on the home page of the site when it gets posted. We’ve just got the first page pinned there this week so everybody can start from the beginning and not miss the first page. With the script already written, he’s got nothing better to do! That doesn’t look like drawing, Honeycutt! Back to work! How am I the only one who’s super amused by a jazz bar named Ja Zhands? Ahhhhh, I didn’t see the darkened out Z! ha! He’s the DHU equivalent of Ja Rule. Please tell me that this location will get a writeup in the new version of the RPG? So, Jimmy, what year does this take place? Is it before the movies? Forget everything you knew about the movies. The comic’s a complete reboot, taking place roughly nowish. Fun fact, that’s an actual Rugby horizon behind Jazzhand’s. First one to pin it on Google Maps gets a free drawing digital handshake.